Anyone seeking to understand the last years of the Cold War should read this book. The central figure is Oleg Gordievsky, now in his eighties and living in a (hopefully) safe house near London. The son and younger brother of Soviet security officers, Gordievsky studied at a college in Moscow for prospective diplomats and spies, and gradually became a trusted employee of the Committee of State Security (KGB). His faith in the Communist system was shaken by Khrushchev’s expose of Stalin’s crimes in 1956 and by the construction of the Wall in 1961 to halt East Germans from moving westward. Posted to East Germany and then Denmark, he was eventually stationed in London where he rose to deputy spy chief based at the Soviet embassy. In London he and his wife put their two daughters into a private school where they became proper English young ladies. For ten years, however, Gordievsky also worked for M16, the British foreign intelligence service. In the world of diplomats and spies things are seldom what they seem. One of Gordievky’s jobs was to meet and gain information from knowledgeable English people. M16 labored to provide such contacts, trusting they would transmit only “chicken feed”—information that had little substantive value. Thus, Gordievsky met several times with Rosemary Spencer, a researcher for the Conservative Party but also moonlighting for M15, responsible for domestic security. Oleg knew she was an M15 access agent. She knew he was KGB (not just another diplomat). But she did not know he was working for M!6. Their relationship became a solid friendship, but it was also one of deception. They were lying to each other with genuine affection. Gordievsky’s unique placement permitted him to temper the Cold War. President Ronald Reagan’s rhetoric, his arms buildup, and NATO’s ABLE ARCHER war game led the Kremlin in 1983 to fear an American first-strike and prepare to respond. The messages from Moscow to London that Gordievsky passed on to M16 provided an epiphany for Reagan. Gordievsky’s timely warnings via M16 kept things from going too far. In 1984 Gordievsky used his position to inform the Kremlin what issues the Margaret Thatcher government would raise when Mikhail Gorbachev, soon to become number one in Moscow, visited London. Gordievsky suggested what should be her demeanor when she visited Moscow for the funeral of another aging party leader. The double agent shaped the content and style of the Thatcher-Gorbachev meeting and her recommendation to Reagan that the West could do business with this man, who became party leader the following year. 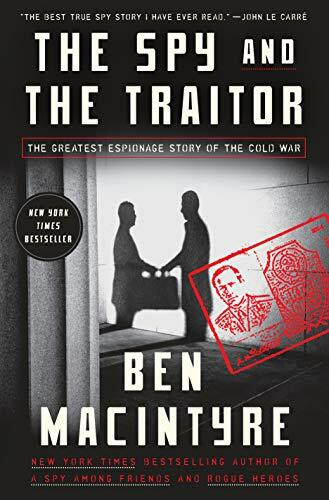 Author Ben Macintyre has also written books about double agent Kim Philby and espionage missions in World War II. He is an old hand at abstracting the essence of complicated events. This book is based mainly on interviews with Gordievsky and other former spies for the United Kingdom, USSR, and United States. Macintyre’s selected readings seems quite adequate but there is no indication he has used any document or book in the Russian language.